Situated proudly above the south bank of the river Kiso, Inuyama Castle is more than 500 years old, and is celebrated as a pillar of Japanese history and culture. Inuyama proudly bears the title of the oldest castle in Japan, although this issue has caused debate in the country. It is one of the 12 palaces of Japan, which were built before the Edo period. In parallel, the Inuyama Castle was named a Japanese national treasure - Rank, which is applied to only 3 more castles - Himeji Castle, Hikone Castle and Matsumoto Castle. Inuyama dominates the eponymous Japanese city located in Aichi prefecture. Kiso river itself is considered a natural border between Aichi and Gifu prefectures, and Inuyama can be found downstream of the river, after the railway bridge, built on it. The exact date of construction of the palace is the topic of heated debate because it is quite difficult to determine, given all the earthquakes, fires, wars and changes of owners. 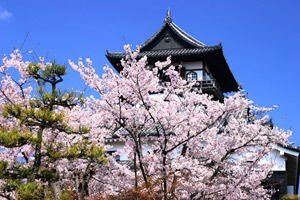 However, experts suggest that the original construction of the Inuyama Castle was in 1440, although at this time it was nothing more than a little fortified house or small castle. In its present form, Inuyama was erected in 1537 by Oda Nobuyasu, who was uncle of the great Oda Nobunaga. At that time the palace had an important role for controlling the river Kiso. Today the Inuyama Castle is considered an invaluable example of defensive architecture Momoyama (Momoyama Period defensive architecture). Original Inuyama existed as a fortress with a tower from the period of civil wars in Japan, known as the Sengoku era. In the following centuries in the territory of Japan are boiling continuous wars, the palace passed into the hands of various rulers. Unfortunately the castle, built in the 16th century, was seriously damaged by earthquakes and natural disasters. The current Inuyama was erected in 1965. Today the Inuyama Castle does not impress with large proportions, and especially with its architecture. It has three floors on the outside, four inside and two levels below ground. On the top level is located an observation platform from which a magnificent view of the surrounding mountains - Kisoontake, Mino, Gifu Castle and the Nobi Plain. The oldest part of the structure of Inuyama is taken once from the Kanayama Castle and has withstood the restoration period between 1961-1965. Lovely cherry garden, which is almost mandatory for Japanese palaces, is not absent in Inuyama. Especially beautiful and pacified, this garden is a popular place for relaxation with its over 500 trees of the most popular Japanese cherry blossom Somei Yoshino. The Inuyama Castle is entered against an entrance fee of 500 yen, which is about 3 euros.